Packing a perfect school lunch that’s both healthy and fun. While breakfast is touted as the most important meal of the day, when it comes to the health of young children, you can’t overlook lunch. 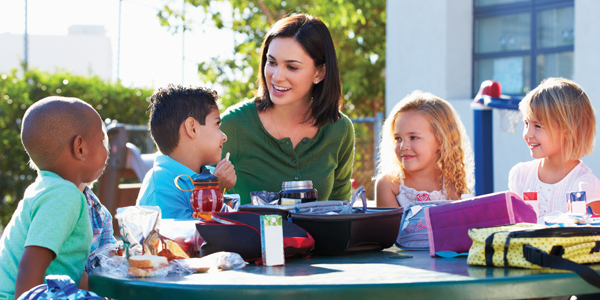 A healthy, balanced school lunch will sustain your child’s energy and concentration throughout the afternoon. “Any time you have a big gap of time between meals, your blood sugar drops and your concentration is compromised,” says Erin Schenkenberger, a dietitian for the Summa Health System. For a well-balanced lunch, she recommends including these basics: something whole grain, a fruit, a vegetable, a form of protein and some dairy. Knowing what to include is one thing, but finding the time to pack a healthy lunch can be difficult — not to mention the challenge of getting your kids to actually eat what you’ve packed. Luckily, several dieticians and experienced moms have offered their input for making elementary school lunches nutritious and fun. Being able to whip up a great school lunch requires some planning. Think about your budget and time constraints during the week, then shop and prepare accordingly. Even an ultra-healthy lunch isn’t beneficial if your child won’t eat it. Try adding an element of fun so your kids look forward to their meals. “If you teach them the importance of healthy food and eating treats in moderation, they’ll understand why they can’t have junk food in their lunch every day,” Schenkenberger says, adding there are other ways to make lunch exciting besides putting in sweets — fun straws, bento boxes and shiny packaging, for example. Goss includes non-food items, like a pencil, bookmark, stickers or a personalized note, to spice up her daughters’ lunches. If you’ve been stuck in a lunch-packing rut or are on a quest to improve your child’s nutrition, the start of the school year is a great time to revisit your strategy. With a little planning and creativity, lunch just may become the best part of your child’s day. For more lunch box ideas, visit Northeast Ohio Parent’s “Lunch Box” Pinterest board. Previous article Is LeBron James Making You Anxious?